What if you had a way to heat up and relax your aching muscles and back pain? Heating pads are a popular option, but you are confined to a chair or bed due to the electrical cord. There is good news. You can find portable, cordless or battery-operated heating pads to take anywhere and relieve your aches and pains whenever and wherever you want. Battery-operated heating pads are also great for warming up your feet and hands after you have been out in the cold or you are just highly sensitive to the cold weather. You can carry one in your care and use it to warm up and stay warm on your drive home, or if you travel. Whether you suffer from acute or chronic pain, battery-operated heating pads can be your best friend. The portability of these heating pads not only allow you to take it with you on the go, but they also allow you to use them for specific muscle pain. For instance, you can find these devices for your back, knees, arms, legs, neck, etc. The Brite Leafs Rechargeable Heating Pad is easy and safe to use as well as portable, cordless, and rechargeable. 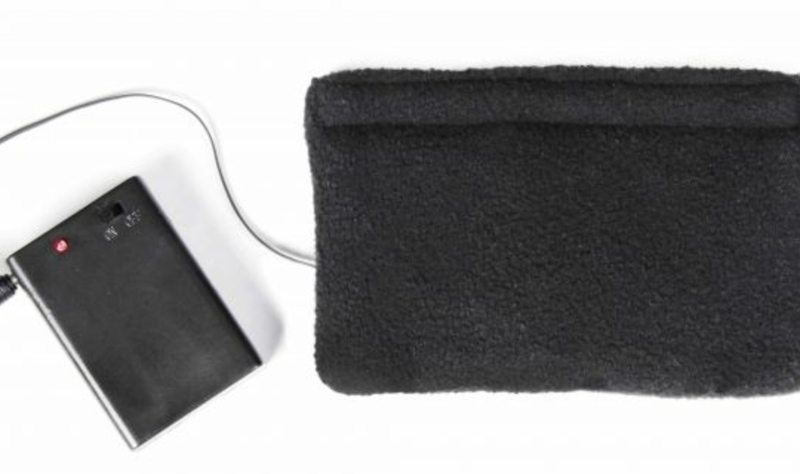 This cordless heating pad uses far infrared technology known to be highly therapeutic. Far infrared technology is capable of penetrating up to 3 inches under your skin to get into your muscles and bones, which helps to relieve pain. That kind of deep penetration maximizes the therapeutic effect. You can use this heating pad for between two and four hours (operational time relies on the temperature). You can secure the heating pad with the Velcro tape and be comfortable due to the contour fit of the heating pad that can be extended up to 70 inches. Having a portable heating pad is beneficial when you suffer from back pain. The ability to take your heating pad with you is ideal when you want to relieve your back, shoulder, stomach, muscle, cramps, or arthritis aches and pains without being constrained by a cord. The ARRIS battery operated waist belt allows for adjustable heating for the lower back, but can also be used on the knees, shoulders, abdomen, or waist for pain relief. This heating waist wrap is perfect for people of any age. Far infrared technology is one of the reasons it is such an effective therapeutic heating pad. This is better than traditional heating pads because it can be secured to the painful area and it adjusts to fit where you need it. This heating wrap is ideal for promoting blood circulation as well as relieving stress, tension, stiffness, cramping, and muscle pain. You can adjust the heating level from low to medium or high as needed. Powered by a 7.4V battery, this heating wrap is sufficiently powered to meet your needs. Most other heating waist wraps use only a 5V battery. Built-in thermal protection prevents overheating. The heating belt can be hand washed without the concern of electrical leaking. Wireless technology is one of the features that make the Newton Health Mate Cordless Wrap so popular. This heating pad is highly suitable for active people. It has a rechargeable USB lithium-ion battery to enhance portability and freedom all while getting pain relief. The Velcro cinch straps promote optimal comfort as it is designed to fit virtually any size person and adds yet another dimension of freedom. You can take it anywhere you go, allowing for pain relief on the go. The simplicity of operation of this heating wrap is another benefit beyond pain relief. You just turn on the battery pack, choose your desired heat level and get comfortable. You have the options of low heat, medium heat, and high heat, ranging between 95 and 140 degrees. You can charge the Newton Health Mate Heating Wrap via micro-USB with built-in flash LED. The battery pack can also be used to charge compatible electronics and mobile phones. Auto shut off is a safety feature included with this heating pad. A little bonus of this product is that it comes with a gel cold pack that you can store in your freezer when you need to have hot and cold therapies for pain or inflammation. The wrap has a cold pack pocket you can use to apply the cold therapy. The Hot Shot Portable Heating Pad is an Amazon Choice product and is marketed as the best heating pad on that selling platform. It comes in six designs and is a safe, strong, and soft portable heating pad. Each unit features six layers of protection, security charger, and a heating element. You can charge it and go. Not only can you use this heating pad as a portable pain relief device, you can also use it in place of heated blankets or hot water bottles since once it is totally charged, but it can also be used all night. If for some reason you are not satisfied with this heating pad, Hot Shot will provide a full refund with no questions asked. This company is known for its superior customer service. When you need pain relief via heat, portability is an important factor when choosing a heating pad or wrap. These cordless heating pads and wraps are ideal for those people who want to enhance their quality of life without feeling confined to a cord. Remember to consult with your doctor or another related medical professional before you use any kind of pain relief device. Also consider factors such as value (more than price), features, and your preferences so you can choose the ideal cordless heating pad or wrap to meet your specific needs. Any of these cordless, portable heating pads or wraps would make a perfect gift for birthdays or holidays for people in your life who suffer from back, neck, shoulder, joint, muscle, or other aches and pains. I think I might get the heating wrap that looks sort of like a scarf. I could use it at work as well as at home. It’s terrible when I’m in the middle of doing something and my neck starts hurting. And as I’m an accountant and have to sit all day, neck pain is something that’s now a daily occurrence.